The majority of South Koreans consider complete denuclearization of North Korea an unlikely outcome, despite largely agreeing with the Moon Jae-in administration’s engagement policy. In a survey of 1,000 people nationwide conducted between Aug. 10 and 12 by The Korea Herald in collaboration with the research firm JoWon Communication Innovation, 73 percent of the respondents said that North Korea is unlikely to completely denuclearize. Among them, 29.3 percent said they expect North Korea to renege on its promise, while 43.7 percent said only partial denuclearization would be achieved. The results also showed that those aged between 19 and 29 -- the youngest group in the survey -- are most likely to be skeptical, with 36.4 percent saying that North Korea will backtrack, and 42.4 percent saying that only partial denuclearization will take place. In considering whether North Korea is likely to break its promise, the youngest group was followed by those aged 60 and above with 33.2 percent of respondents, and by those in their 50s with 32.8 percent. As for President Moon Jae-in’s North Korea policy, 56.2 percent of the respondents supported the current direction, with an additional 22.9 percent saying that they approve of Moon’s policies, though adjustments are necessary. The survey showed a clear divide among regions on Moon’s North Korea policies. Moon’s policies received the highest support in the Gwangju and Jeolla areas -- the stronghold of the ruling Democratic Party -- and the least in the traditionally conservative areas. In general, the 19 to 29 age group was shown to have stronger conservative sentiment more often associated with the older generation. The most common answer to the question on the appropriate amount of time for unification with North Korea was five to 10 years, with 33.5 percent of respondents, while the most common answer for the 19 to 29 group was that unification would not occur. In the survey, 24.9 percent of those in the group said that unification would not happen. In comparison, the answer did not exceed 15 percent in all other age groups. On the subject of US troops in South Korea after a peace deal is reached on the peninsula, nearly 70 percent of respondents said that their continued presence is necessary. The survey also showed that the US is considered the most reliable nation among those involved in six-party talks on North Korea’s denuclearization. Overall, 55.7 percent of the respondents picked the US as the most reliable country among China, Japan, North Korea, Russia and the US. Although the survey’s respondents had mixed feelings toward Seoul’s North Korea policies, and the likelihood of denuclearization, most appear to agree that the security situation on the Korean Peninsula has improved in recent months. 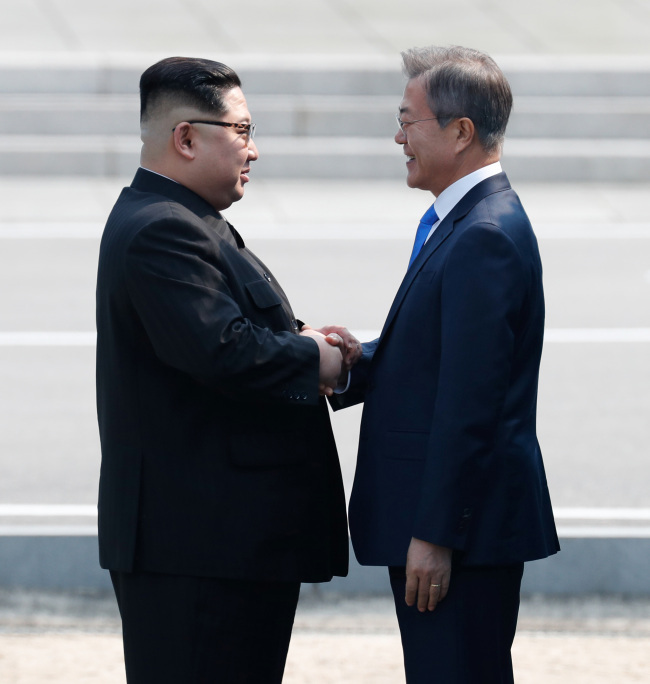 According to the survey, 68.3 percent said that the situation has improved in varying degrees since the inter-Korean and US-North Korea summits, while less than 30 percent said the situation remains unchanged.